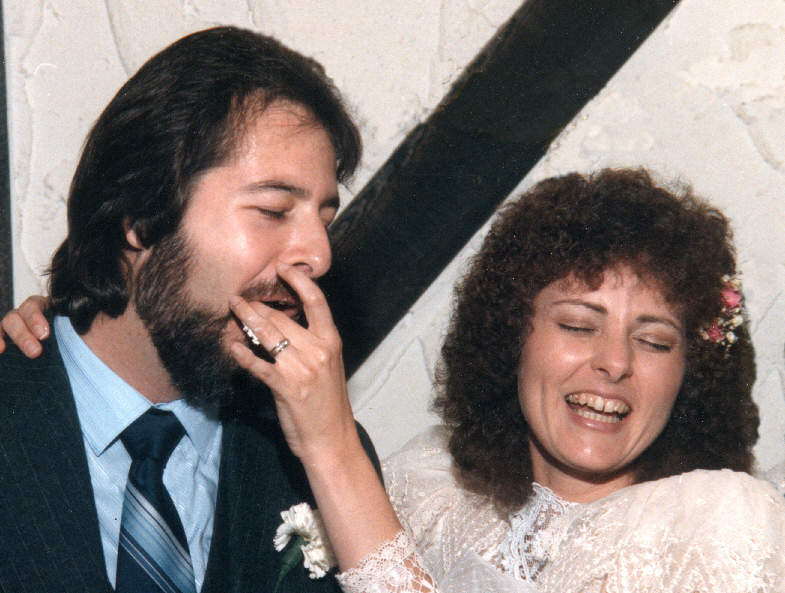 After finding a snapshot of my parents sharing cake at their wedding, I thought it would be fun to see how my husband and I looked performing the same ritual. We didn't bother with forks, but just grabbed a slice of cake by hand. And clearly, nobody had advised us about the importance of small portions. I was afraid to look! Amazingly, we both got fed without getting crumbs in his beard or frosting on my dress. By the way, it was a fabulous cake. Traditional white frosting on the outside, dark chocolate with amaretto filling inside. Yum! Rosemary, the word 'fun' comes to mind. You are beaming! I love seeing both the pictures of your parents and of you and your husband. And the cake sounds delightful. We had a whole spread of Italian desserts, and I was so busy I didn't have one. Some day, I am going to order as many authentic Italian desserts as I can afford, spread them out on a table, and gobble as many as I can. Put that on my list of 1,000 thing to do before I die! It's amazing how little you get to eat at your own wedding, isn't it? I see fun in this photo, Rosemary. I could not think of a better way to begin a life together. Well done to have worked around the beard too. That's serious.